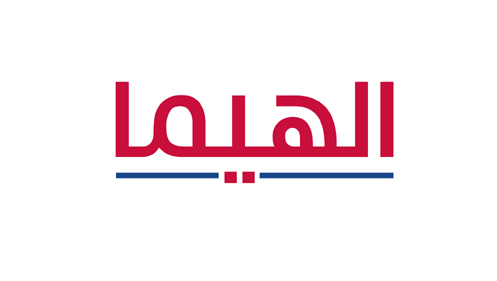 Few weeks ago, we were asked at the office of Tarek Atrissi Design (www.atrissi.com) to design an Arabic translation / Adaptation of the HEMA Logo. HEMA is a famous Dutch department store- and this arabic adaptation of the logo came as part of a project / exhibition initiated by the Khatt foundation in Amsterdam and Mediamatic. The Exhibition in mainly promoting new Arabic fonts developed through a cultural project by the Khatt foundation, and inviting artists and designer to use their imagination and imagine how an Arabic HEMA store will look like; using when possible or necessary the new developed Arabic fonts within different applications within that “virtual” store. The contributions to the EL HEMA arabic store will be on display in Amsterdam at Mediamatic in an exhibition showing all what different designers and artist envisioned in this project. – which explored fully new lettering trials or lettering based on some existing Arabic typefaces- led to the development of the Arabic version of the HEMA logo shown below (known as EL HEMA, which means “The Hema” in Arabic). Today, this logo and visual image becomes part of a heated discussion and press interest, as HEMA is filing a law suit against Mediamatic for inappropriately using its identity and image. 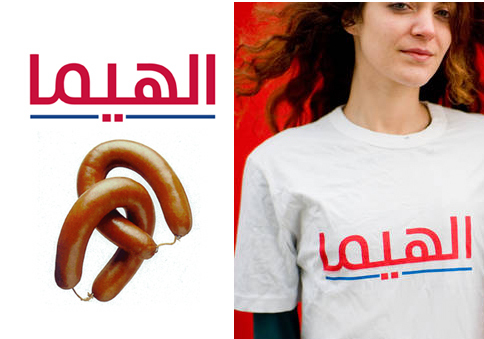 Suddenly the logo we developed, either shown next to the famous HEMA sausage or on T- Shirts, is appearing everywhere on all newspapers, TVs, and press releases discussing this debate. A situation that extends beyond the typographic context we initially projected. We wish Mediamatic all the luck in this debate as we know the end goals of this exhibition and EL HEMA arabic initiative is a cultural one, and as an experimental design and typographic initiative.